Exclusive for Grab’s Platinum users! Get a BNK48 The Campus ticket for FREE! Get a BNK The Campus ticket for free! when you’re a Grab’s Platinum user and have 5,000 GrabRewards points! Apart from we’re giving a BNK48 The Campus ticket by applying the codes include the name of BNK48 members, we also have another special privilege for Grab’s Platinum users to receive the ticket for free! BNK48 fans don’t miss! 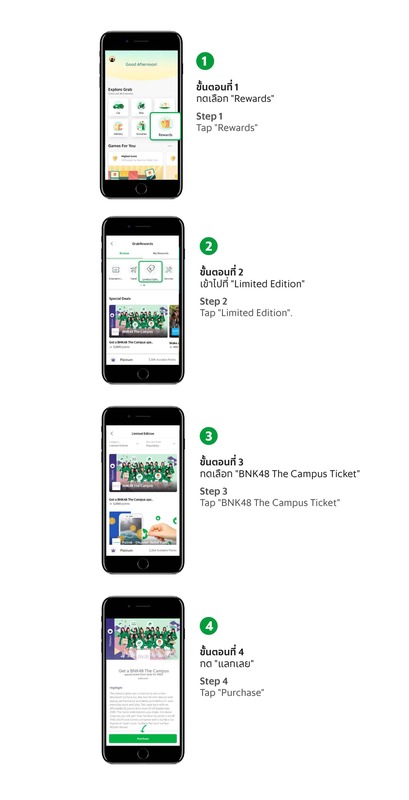 Here’s the BNK48 The Campus special for Grab’s Platinum users only! Simply redeem your GrabRewards points, you will get a ticket for free! For Platinum users. – Redeem your 5,000 GrabRewards points to receive a BNK48 The Campus special ticket from Grab on February 26th, 2019 at The Mall Bangkapi for free. During 13 Jan – 15 Feb 2019. Tickets are available in a limited quantity. Redeem now! Grab users on Platinum tier are required to use 5,000 GrabRewards points to redeem 1 BNK48 The Campus special ticket from Grab. The show will take place on 26 February 2019, 19.00 hrs at The Mall Bangkapi. The ‘BNK48 The Campus Ticket Reward’ will be automatically sent to ‘My Rewards’ menu after redeemed. Campaign Duration : From 13 January 2019 – 15 February 2019 (23.59 hrs). Grab’s Platinum users who redeem the reward will get an email confirmation via their registered email address within 18 February 2019. By taking part in this campaign, you have read, understood and agreed to be bound by these terms and conditions. You also acknowledge and agree to be legally bound by the terms and conditions herein including any terms and conditions that may be adjusted or terminated in the future by the Company. You further agree that all decisions of the Company shall be final and conclusive. BNK48 members in the show includes Cherprang / Pun / Noey / Jennis / Mobile / Music / Mewnich / Pupe / Namnueng / Wee / June / Cake / Ratah / Fond / Natherine / Phukkhom. The ticket prize is non-transferrable. No cash alternative is available for any prizes. The Company reserves the sole and absolute right to terminate the winner’s right to claim the prize incase a fraudulent/illegal activity is suspect, or the winner does not follow the campaign terms and conditions. The record of the Company is final, in relation to the order of redemption.